The start of the school year is two weeks old and it has been a doozy. My schedule has changed multiple times with a new set of students in my class one week after school started and two days before back to school night with the parents. I've done my best to provide the best environment for my students, but it was tough not to feel run down and a sense of doom if this was how the school year was going to be like for me. 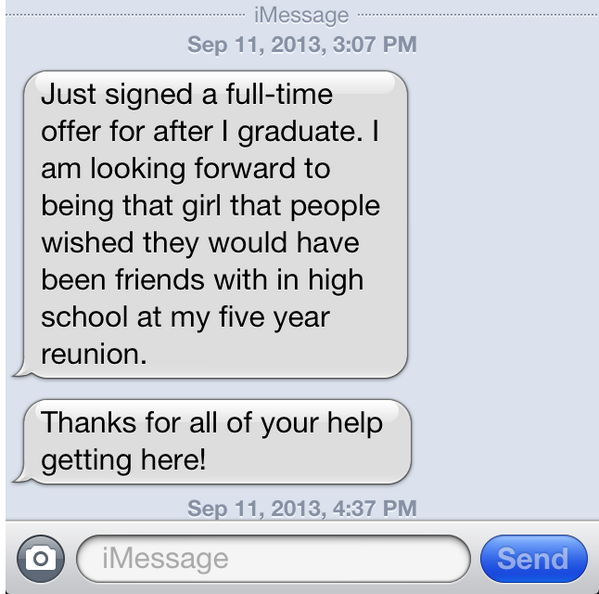 When things were at their worst, I received this text from a former student. It was as if my bas vibes were sent across the universe and straight to this student. This was the pick me up that I needed and gave me the boost of energy. There will be days that I hate being a teacher, but I will always love teaching. I think that is the one thing I need to remind myself when things in the "Teacher World" get crazy. Teaching is exhilarating and awesome. I have a chance to make an impact on students in ways that I will not realize until much later in life. For all of you out there that might behaving a rough start of the school year, remember that you are making a difference in the lives of so many different students. You might not see any results until years later, but do not let the small things get in your way of making an impact on the lives of the people that matter most each day at school. Yes, it's texts, notes, and comments like that that make even the worst days worthwhile. COngratulations on making a difference. You should know you make a difference to numerous teachers like myself who read and follow your blog. So true, it is those moments that remind you of your influence and impact on young peoples' lives. Blogged about this exact thing a while back. I keep a letter from a former student pinned up by my desk as a reminder.